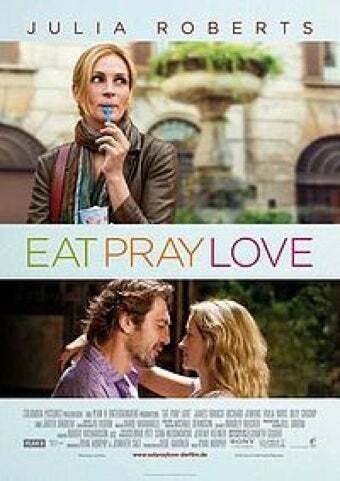 Julia Roberts' latest film, "Eat, Pray, Love" opened in theaters this weekend. My neighbor, supermarket tabloid aficionado Helen Peters, wrote in to share her thoughts on the matter. Every so often, my friend Barbara and I like to do a Girls' Night Out, you know, put on a little lipstick and a fancy get-up and head out for dinner and a movie, the whole shebang. Barbara even sticks a bag of homemade popcorn in her purse for us to munch on during the show, because good Lord in Heaven those theaters rob you blind at the concession counter. Do you know how much it costs to pop popcorn? Something like negative 8 cents, I read somewhere. Cheap, you know? But they bump up the price and people pay for it, because apparently their parents never taught them the value of a dollar. I mean, you get in there—after already paying 800 dollars for the ticket, mind you— and they want you to spend another seven dollars on a medium bag of popcorn, which, by the way, is probably filled with all kinds of garbage. It's like they're trying to kill you! If you don't have a heart attack over the price, they'll get ya with the half a pound of salt they throw on top of that junk, you know? It's like swimmin' in the ocean eatin' that stuff. I'm trying to have a snack, not salt my intestines like a driveway in the middle of December! I do appreciate the free refills on the Diet Pepsi, though. That's just good business. Anyway Barbara and I went to see the new Julia Robert picture, because I just love Julia Robert, she's a real movie star, you know, not one of these ridiculous starlets I see in my magazines every week who feel the need to air their dirty laundry on national television, like those Jersey Shores girls or those awful people who keep trying to find husbands and wives on game shows. Not that it's any of my business, but any man who dates twenty girls at once and isn't on a break from fighting in the Pacific, God bless him, is not the kind of man you want to make your husband, no matter how many roses he hands out or what kind of mansion he lives in, which is precisely why he's still a bachelor in the first place, because any woman with an ounce of sense and a working nose can smell a phony from miles away. Romance, in my day, was worth a bit more than picking a wife out of a contestant pool. Game shows—the classy ones, anyway—are for winning money and sensible appliances, and maybe an occasional trip to Hawaii or a lifetime supply of Citrucel. Wives and husbands, not so much. So anyways, back to the story: after I found a sitter for my Albert—that's my dog—Barbara and I headed out to the movies, popcorn in tow, and settled in to watch the new Julia Robert picture. And it was fine, you know, worth the matinee price mostly because of the air conditioning—I don't do well in this humid weather, makes me very irritable—and for the shots of that dreamboat, Javier whats-his-face, who can sweep me off my feet on vacation anytime he pleases. Him, I'd go on a game show to marry. The man has the kind of face that could light a candle on a birthday cake from seven blocks away, ah-cha-cha, get out of here! So after about two hours of watching Julia Robert travel all over the world or what have you, Barbara and I drove home from the movie, and, like we usually do, we discussed, and we decided that the real problem with the movie was the fact that Julia Robert had to go all around the world to do three simple things: eat, and then, you know, pray, and then fall in love. Must be nice to have the kind of money to do all that, but it doesn't strike me as particularly sensible. I can eat, pray, love in the comfort of my own house for practically nothing: it might not be Italy, but I can boil water and make pasta without getting on a plane, and prayer is free, thank God, and the love part, well, I might not have the cash to fly to Javier Gorgeous' house, but I like to think that love can happen anywhere and that you don't need to be on vacation—or on a game show, for the love of God—to accidentally find it. Unless you're my son Kevin, of course, and then you couldn't find love with a map and a metal detector and a giant X that says, "Love is here, Kevin, for cripes' sake will you please comb your hair and find a nice girl and give me some grandchildren sometime within the next century." But I mean, you know, kudos to Julia Robert for doing all of these things and looking gorgeous to boot. She could have done all of these things without getting on a plane is all I'm saying, because really these are all changes that come from the inside, you know, the way you look at things, and you could maybe do them without going through the hassle of checking your bags and having to throw out the brand new bottle of Jergens you picked up at the CVS because "it's too big to be a carry on." Like I'm going to cause a ruckus with a bottle of Jergens!? The worst that can happen is that I over moisturize and end up looking too gorgeous for air travel. They'll have to land the plane due to my soft, silky hands. Taking away my Jergens. Don't think I've forgotten it, Delta Airlines. I had dry skin for days because of you. Albert wouldn't even let me pet him, he was so horrified. He's a very sensitive dog, my Albert, and he's very special, which is why I feed him and pray for him and love him every day. Maybe all Julia Robert really needed in that movie was a dog. They could have called it, "Eat, Poop, Love: The Story of Albert." Now that's a picture I'd even buy a big bag of garbage popcorn for.